This is an unusual project, an artists studio on stilts so that it could be built on a floodplain. Timeless Garden Rooms have incorporated several bespoke features including a kitchenette with double Belfast sink, a storage area and metal treads on the staircase. 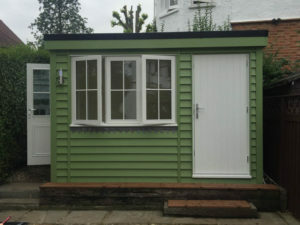 This small garden office with storage shed by Timeless Garden Rooms mixes a traditional painted finish with a modern mono-pitched roof. This garden office was built in a tough planning area. The Timeless Garden Rooms team worked closely with the Local Authority and the customer to design a traditional style garden office that fitted the bill. 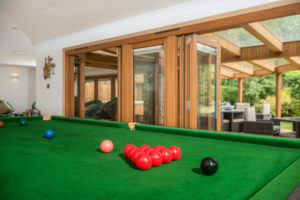 Timeless Garden Rooms were recently commissioned to replace an old conservatory on a Listed Building with a highly insulated garden music room that could comfortably be used all year round. This Timeless Garden Room needed the consent of the Planning & Conservation departments, but the Timeless team handled all of this without hassle for the customer.